Corners take their fair share of abuse. 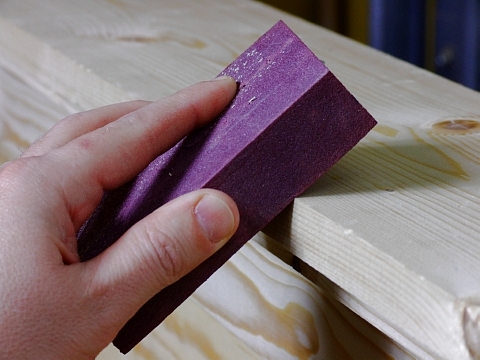 Look at any desk, table, or bookcase with a bit of age on it and you’ll find a chunk missing or areas eroded down. Moving (from room to room or across country) and just plain ol’ everyday use will create these beloved features. On new projects I create I’m doing my best to avoid any sort of imperfection – that is unless I’m going for that look. I used to cringe at being asked to create a distressed piece. Now I almost hope someone asks me to do it. I use a couple of easy techniques for edges and corners that anyone can recreate. Yep, just scoop out a chunk right along the edge. 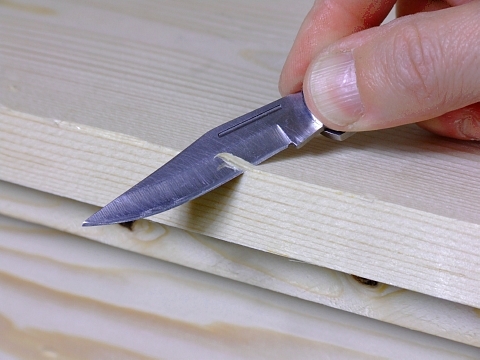 Use a sharp pocket knife or a chisel. I vary it from large scoops to notches. The trick is learning how to make just enough marks to look natural, yet not too many to look manufactured. On the latter, think of some “high end” catalogue pieces you’ve seen – a pattern should NOT exist when it comes to creating a natural worn look. Be sure to whittle where it makes sense to see chunks taken out of a project. Imagine yourself moving the piece. Could you see a certain part bumping into a wall easily? What would happen if it dropped on a sidewalk? Keep these things in mind. One other tip: You want these scoops and notches to look like they’ve been their for years, so do some sanding to smooth any sharp edges. As simple as it gets. The above photo is of a sanding sponge. I use them on softwoods to give that slightly rounded over appearance to a corner, as if a hand has run along it hundreds of times. You can get more aggressive with a detail sander, but don’t go crazy. Again, think of natural wear and tear. The front edge of a desk is a natural area to wear down, but the top edge of a six-foot bookcase is not.